One of the country's most acclaimed chefs, 2016 James Beard Award Winner Renee Erickson is a chef and the owner of several Seattle restaurants: The Whale Wins, Boat Street Café, The Walrus and the Carpenter, and Bateau. This luscious cookbook is perfect for anyone who loves the fresh seasonal food of the Pacific Northwest. Defined by the bounty of the Puget Sound region, as well as by French cuisine, this cookbook is filled with seasonal, personal menus like Renee’s Fourth of July Crab Feast, Wild Foods Dinner, and a fall pickling party. Home cooks will cherish Erickson’s simple yet elegant recipes such as Roasted Chicken with Fried Capers and Preserved Lemons, Harissa-Rubbed Roasted Lamb, and Molasses Spice Cake. Renee Erickson's food, casual style, and appreciation of simple beauty is an inspiration to readers and eaters in the Pacific Northwest and beyond. RENEE ERICKSON is the chef-owner of Seattle's Boat Street Café and Boat Street Pickles, and co-owns The Walrus and the Carpenter, The Whale Wins, and the Narwhal Oyster Truck. JESS THOMSON is a Seattle-based freelance writer and cookbook author who has written for Sunset, Cooking Light, Edible Seattle, and Seattle Met magazines. I am one of many—legions, even!—who’ve been inspired by Renee Erickson and her restaurants, and this book is Renee, through and through. Her cooking is like no one else’s: thoughtful but seemingly effortless, evocative of France but firmly rooted in the Northwest, from Mussels in Cider with crème fraîche to Messy Spot Prawns with piment d’Espelette. Even those lucky enough to eat in her restaurants can learn a thing or two (or ten) about food from this smart, opinionated beauty of a cookbook. I’m in love. Renee Erickson cooks like a woman, with generosity, sensuality, and style. In this charming book she shares everything—stunning images, wonderful stories, a passionate philosophy, and her recipes to cook and live by. Renee Erickson tells an incredibly personal story about the PNW and writes with love and respect of the ingredients of our region. There are engaging stories about cool people intertwined cleverly with recipes and full menu suggestions. I especially like the sections on seasonal ingredients and ideas on their best uses. This book is destined to become a great complement to Renee’s already great restaurants. Although A Boat, A Whale, & A Walrus' recipes reflect an intricate intertwining of the Pacific Northwest's bounty of sea, forests, and farms, the book's focus on simple, sourceable ingredients makes the array of mouth-watering menus approachable, whether you're in Erickson's Portage Bay backyard or in the land-locked Midwest. Erickson's book has an Ina Garten-like blend of effortlessness and luxuriousness that makes you believe that king salmon with walnut tarator will practically cook itself. But then, with her forgiving guidelines and clear descriptions...it basically does. Renee’s heartfelt menus inspire me to gather my dearest friends, uncork some bottles of wine, break out the copper pots and experience the casual graciousness of her table in my own home, no matter the season. A Boat, a Whale & a Walrus spins a compelling narrative with bracing charm. . . It illustrates through personal stories, cooking methods, and confident opinion a sense of place and a sense of self. Included are many beautiful photos, which evoke near perfect moments, including portraits of . . . her friends and colleagues: the cooks, mentors, foragers, gardeners and fisherman of her magnificent Puget Sound. Just like Renee herself, this book is perky, colorful, energetic, and full of fun. And they both make you smile! I love the fact that she pickles everything, would wear smoke as a perfume (so would I!) and feels that, when it comes to cooking, there is a very thin line between properly cooked and burned! The books makes me want to visit all of her restaurants all over again, and rush into the kitchen to make her vibrant Celery Root and Celery Leaf Salad, the well-spiced pork Crépinettes, and of course her famed Chicken Liver Pâté. Every so often a cookbook comes along that looks good, is written with style, and more important, you find yourself cooking from it and looking for ideas from it all the time. Renee’s ideas inspire hunger and they work. I can already predict that I’ll wear out my first copy. This is a book about feasting and unfussy, brilliant food that you’ll want to make again and again. Erickson owns Seattle restaurants Boat Street Cafe, the Walrus and the Carpenter, the Whale Wins, and Barnacle. For gourmets who appreciate the details of a beautiful restaurant cookbook, her debut (coauthored with food writer Thomson) offers plenty to savor--moody photographs of outdoor outings, elegantly laid tables, and proud food producers; eloquent reflections on earthy wines and vegetal escargots; and seasonal menus (e.g., Wintry Brunch, Fourth of July Crab Feast) . . . VERDICT: If a trip to Seattle isn't possible, this book provides the next best way to enjoy Erickson's beautiful seafood. 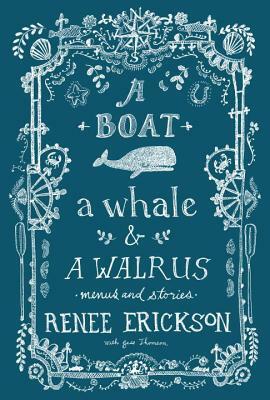 Here's A Boat, a Whale & a Walrus: Menus and Stories by Seattle chef Renee Erickson (The Whale Wins, Boat Street Café, The Walrus and the Carpenter, and Barnacle), and if there is a better looking new cookbook out this fall, I haven't seen it. Page after page of jewel-like Pacific Northwest cuisine is accompanied by perfect, aspirational images of beach cookouts, cozy winter meals by the fireplace, and autumn meals at long picnic tables dotted with candles and bottles of Calvados. Watch your back, Ina Garten: Renee Erickson has come out to play, and she's a tremendously successful restaurateur, to boot. Few do Pacific Northwest cool like Seattle's Renee Erickson, owner of The Boat Street Café and The Whale Wins among others. Here she organizes her recipes (not just for seafood, mind you) into menus such as Renee's Fourth of July Crab Boil and a Wild Foods Dinner. Follow her effortless lead for those "Oh, I just pulled this together from what I caught this morning" dinner parties we all aspire to.
. . . While some restaurant cookbooks can feel overly cheffy, inaccessible, or better suited to a coffee table than your kitchen shelves, Erickson’s is all personality and warmth, that combination of inspiring and accessible that we’re all looking for in a cookbook. Fans of Renee Erickson have been waiting for the award-winning chef and retaurateur's first cookbook. In this case, nobody will be disappointed. A Boat, a Whale & a Walrus will be available later this month and is everything you would expect from Erickson: simple elegance that is both effortless and delicious. Divided into seasonal menus, this is a celebration of our local seafood and flavors . . . The result is an artful book, perfect for gifting. If you cannot dine in an Erickson restaurant every night, this is the next best thing. Renee Erickson pours herself into her four Seattle restaurants like she pours rosé at a dinner party: generously and endlessly, to bring people together, to help them feel relaxed and well-taken-care-of, and to facilitate a good time and good conversation. With her first cookbook,A Boat, a Whale, & a Walrus: Menus and Stories (named after three of those restaurants: Boat Street Cafe, The Whale Wins, and The Walrus and the Carpenter), she intends to help readers do the same . . . The food in the book is at turns refined and humble, but is always accessible. The ingredient lists are rarely very long, and techniques are uncomplicated and thoroughly explained. I love that this cookbook is arranged not by chapters but by menus. Erikson shows us how to put together a complete meal and share it with friends. The recipes on each menu walk that line between restaurant-fancy and actually doable by your average home cook. Most of the emphasis is really on using great ingredients rather than shmancy techniques. Renee Erickson worked on the concept for "A Boat, a Whale & a Walrus: Menus and Stories" for a year before landing on the right approach, one that balances people, aesthetics, and her favorite seasonal menus from the Pacific Northwest. In reality, the 42-year-old self-taught chef has been at work on the story since her mid-20s, when she opened Boat Street Cafe, the first of her four Seattle restaurants. Erickson’s personal take on food is on view in the book, beautifully photographed by Jim Henkens and illustrated by Jeffry Mitchell, both longtime friends of the chef. In this new era of cookbooks, storytelling is nearly, if not more, important than the recipes. Depending on your proclivity, that’s either a great thing or an annoyance. While I love a "hardworking" cookbook—i.e., one in which the recipes are fail-safe and speak to the home cook—I’m also a sucker for beautiful photography and good stories. In both respects, renowned Seattle chef and restaurateur Renee Erickson’s new A Boat, a Whale & a Walrus (Sasquatch Books) succeeds. It handsomely sheds light not only on her restaurants, but on the Pacific Northwest. Renee Erickson's debut cookbook is exactly what you’d expect from the first lady of local fare: a 300-odd-page love letter to the land and sea—and humans—that begot her wildly popular restaurants (Boat Street Cafe, the Walrus and the Carpenter, the Whale Wins, Barnacle). But this isn’t one of those impressive-but-useless chef’s tomes: The contents strike a nice balance of aspirational (befriend a fisherman so you can always have the freshest-caught Pacific octopus possible, Erickson advises) and straightforward (hey, here’s a nice strata). A Boat, a Whale & a Walrus. Nope, it's not the beginning of a bad joke (boats can't walk into a bar! ), it's the title of Renee Erickson's (Boat Street Cafe, The Walrus and the Carpenter, and others) first book . . . Of the more than 70 recipes, some lean toward fancy (harissa-rubbed roasted lamb; halibut with morel cream), while others are simpler (radishes with Green Goddess dressing; crab melts), but all—with the help of drool-worthy photos by local food and travel photographer Jim Henkens—will make your stomach growl. A rare combination of beauty and practicality, allowing home cooks to enter the Seattle restaurateur’s world and replicate her super-popular signature dishes. Seattle chef Renee Erickson (The Whale Wins, Boat Street Café, The Walrus and the Carpenter, Barnacle) offers a book of seasonal menus (attention other cookbook authors: more menus, please) that showcase the ingredients of the Pacific Northwest. The book is very pretty and evokes the feeling of an Elizabeth David book, while still being down-to-earth enough you might actually use it on a regular basis. If you’ve been paying attention to culinary happenings in the Pacific Northwest, you’ll know that restaurateur and chef Renee Erickson is as good as they come. The luscious image of a skiff on a calm blue sea on the endpapers evokes a sense of place, a spiritual vision of the Northwest that puts you on the shore, looking out to breathe in the salty air. And while the four restaurants Erickson owns don't share the shabby-chic aesthetic of the book, somehow the look works to support the narrative and recipes within. Ambitious home chefs should pick up a copy of [Renee] Erickson's cookbook A Boat, a Whale & a Walrus to re-create her dishes in their own kitchens.